How Do You Say No Without Feeling Guilty? I say Yes a lot. I bet you do too. I like to say Yes because I’m interested in so many things. I like people, I’m social and I want to help. Maybe sometimes I say yes out of guilt, guilty – ness ugh, or how people will view me if I say no. I say yes out of obligation. For these reasons I say, Yes too much. I started thinking I need to say No more, but in reality I’m saying No all the time. I say No like a boss. Wait what??? Slow down. Then I read this quote: “The difference between successful people and really successful people is that really successful people say No to almost everything,” – Warren Buffett. But, what about this guilty thing? Saying NO is very complicated. I have to decide what I really want. Then once I decide on that, I have to decide when to say a real No and how to say it. Not a default No by having said Yes to something else, and not a Warren Buffett, say no to everything no. I get to decide. So do you. So, here I am, deciding that I have to say NO. Now, how do I do that with confidence and no bad feelings (I’m looking at you guilty feeling). In one experiment, 30 women, ages 22 to 53, undertook a 10-day wellness challenge involving goals like exercising more and eating more healthily. The women were divided into three groups: One was asked to use the “I don’t” strategy, another the “I can’t” strategy, and a third (the control group) was simply told to say no. While only 10% of the “I can’t” group stuck with their goal, 80% of the “I don’t” group were still using the strategy successfully 10 days later. I don’t eat sweets during the day. I don’t get less than 8 hours of sleep. I don’t say nasty things about my body. I don’t get it right all the time. The last one is the only one I can really bank on. Let’s be grown-ups and set some policies. Thanks for this article Ann. ‘I don’t’ is a much more positive approach than NO or ‘I can’t’. I am going to work on my list of policies – my list of things that I DON’T do and see if that helps me make some much needed changes in my life. Thanks for providing a new way to look at this! I’m so glad you found it useful, I didn’t invent it but I agree, I think it’s a good idea!! 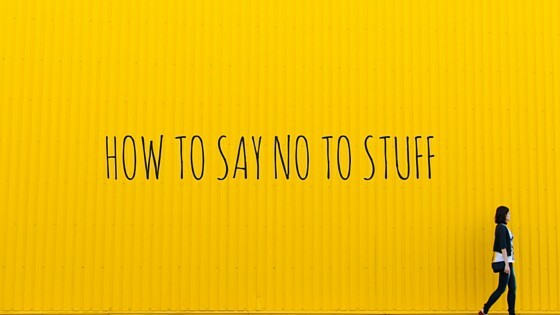 Saying “no” is one of the hardest things to do, especially for women I find. My favorite quote on this subject is from a man. When a colleague suggested they have lunch sometime, he responded, “I could say yes, but I’d be lying. The truth is I have so little free time to spend with my close friends and loved ones, I must choose them instead.” The guy who asked seemed a bit taken aback (per my husband who was privy to the conversation) then he broke into a grin and said, “Thanks. That was way better than lunch because you gave me permission to do the same.” I remember that story each time I say “no” to an acquaintance who wants to have lunch with me. Yes, it’s okay to say “no” even to perfectly nice people who you might wish to get to know under different circumstances. I see it as saying “yes” myself and the people I truly care about.